Normally I am a creamy coleslaw kind of gal. But this was worth stepping outside of my comfort zone. It is bright and fresh and delicious! It has a nice blend of sweet and sour, balanced with a little heat. It has a nice rounded flavor that will knock your socks off. It is great as a simple and fresh side dish, but it is even better on Asian inspired tacos. We put it on our Slow Cooker Honey Sriracha Chicken Tacos and the two are amazing together. You have to give it a try! Mix together lime juice, vinegar, cumin, honey, sriracha, salt and oil. Stir in cole slaw and chill for at least an hour, preferably a couple stirring occasionally. It would be! It is very bright and would be great with grilled meats too! I hope you have a wonderful week and a happy 4th of July. It's funny how cilantro is something people either love or hate! My mom was a hater, so we never had it growing up. I think she has at least come around to tolerating it lately. Have a wonderful 4th! You know I'm throwing this on my chicken tacos!! Yum!!! I hope you love it, Andrea! Oh my gosh, I don't know how I missed that slow cooker recipe last year! Chicken tacos are my jam :-) Especially when you can make them in the slow cooker. I bet this slaw would be delicious on those tacos. I'm definitely going to try the taco and the slaw recipe! They are so good together. They are full of flavor, that is for sure! We haven't had them in a bit, so my husband was super excited when he saw what was for dinner. Definitely trying this recipe. So many of my favorite flavors in one great slaw! It is a fun one, that is for sure! I hope you love it! 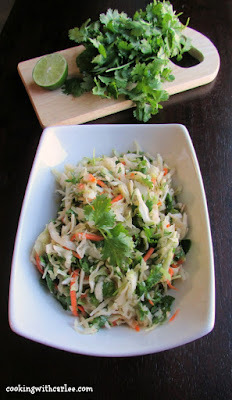 Love the flavours in this slaw. Thank you! We enjoy this mix of flavors! Carlee, this sounds so good! 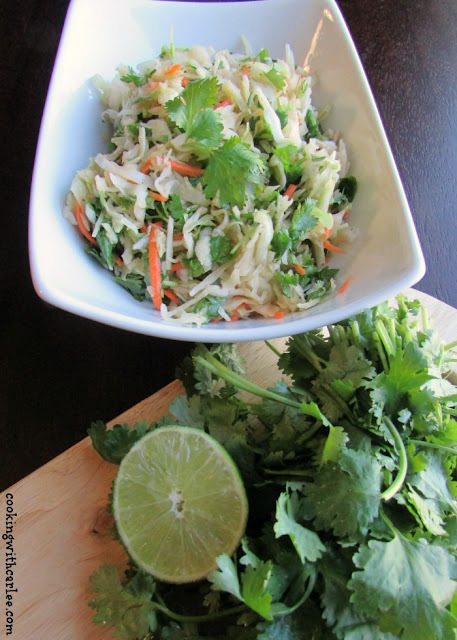 We love an Asian slaw on fish tacos, but this would be a great way to switch it up! I love the ingredients, lime for freshness and the sriracha for a bit of heat! This is going on our summer menu. I bet it would be really good with shrimp kabobs too! Yummy! Oooh, it would be so good on fish tacos! You'll have to let me know what you think if you give it a try! It is a fun way to jazz it up a bit! I will have to stop by, thanks! I will just love the combination for your awesome coleslaw! Thanks so much for sharing with us at Full Plate Thursday this week and come back to see us real soon! I so pinned this! YUM!! Looks like a yummy and light salad for summer! Thanks for joining the Family Joy Link Party! It is a fun one that is for sure! Thanks for hosting! Thanks for sharing your wonderful recipe with us Carlee. This is featured at our Monday Cooking and Crafting with J & J. We hope to see you again. Enjoy your day and week. looks delicious- the cilantro is a nice touch! Thank you! I love all of these flavors together!